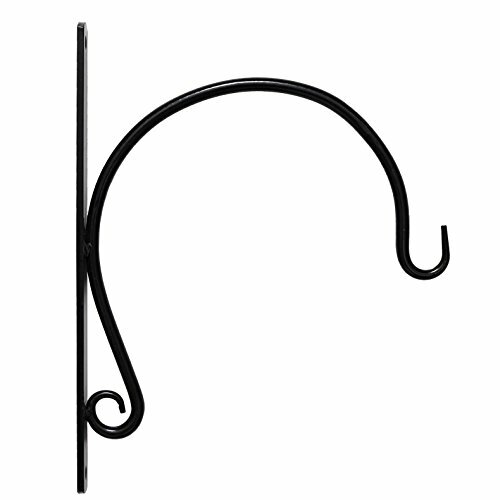 Brighten up your outdoor spaces with the strength and ease of this large, sleek, bracket-style hook. Carefully designed and tested by us, the UB-1044 provides the strength and support that your outdoor pieces are looking for. ✔ Extended Back Plate for Easy Installation and Adjustments. ✔ Powder-Coated, Corrosion-Resistant, Cast Iron. NO NEED TO CHOOSE FUNCTION OVER STYLE because we've had a great time working on the details of this hand-forged, iron hook to make it sleek, stylish, and strong. The long, curvy body offers a classy, modern look. The tapered tip is curved forward and up to provide a secure location for your adornments. BIGGER IS BETTER. This large hook extends 10 inches from where you attach it to the hook's tip. The backplate is 13 and long. SO EASY TO INSTALL. The elongated backplate makes it easy to install the top screw and provides extra support and strength. Simply use the two high-strength, coated, black screws that are included with your hook to attach it to a deck, fence, post, wall, or tree. The black-powder, rust resistant coating provides your hook protection from the elements in your backyard, patio, or garden while enhancing its durability and appearance for years to come.